Given their stellar status as melodious merrymakers on New Year’s Day, one might not be fully aware of the projects and endeavors that members of Mummers clubs see as a necessity for community growth. On Saturday, constituents from 38 of the revered revelers’ entities convened at the headquarters of Bill McIntyre’s Shooting Stars, 1931–33 S. Third St., to further their altruistic fervor, collecting and delivering wish list items to The Philadelphia Veterans Comfort House. The Grays Ferry inhabitant has called himself a Shooting Star since 1992 and has enjoyed considerable success with the fancy brigade, most recently its 2014 parade victory for “Atlantis Guardians of the Deep.” Smiles have often given way to frowns, though, as the 53-year-old often ponders the plight of service figures, leading him to consult with brigade contemporaries about honoring their sacrifices. The overseer has added adulation for such personnel through his father’s participation in the Korean War. Fully aware that life beyond their uniformed days can present severe struggles for veterans, he wanted this year’s outreach to be especially endearing. Enter The Philadelphia Veterans Comfort House. The West Philadelphia-situated haven recently lost its United States Department of Veteran Affairs grant funding and needed to halt its housing activities. An accompanying release for the Shooting Stars-led effort noted the facility is “reopening its doors in a new transition phase that will allow a bright future for homeless veterans, who have served our great nation, by providing a place for their families to once again call home” and tabbed the strutters as the initiators for the revitalization. ED BRYSON HAS always loved lending his time and resources to the strengthening of the Pennsport environs, and, as a member of a family that has committed 160 years to the growth through involvement at the Edward O’Malley Athletic Association, 144 Moore St., he saw Saturday as a rewarding opportunity to show that life as a Mummer consists of more than planning holiday routines. As the morning unfolded, hearing conversations among the generous parties made evident the camaraderie that the clubs have no matter their classification as wench, fancy, fancy brigade, comic, or string band performers. For Mulligan, the Shooting Stars offer him a “magical” opportunity to promote family, love, and Mummery, and he is always eager to meet new faces and create lasting memories. With respect to Mulligan’s enthusiasm for novelty, representatives from the Purple Magic New Year’s Brigade, 38 E. Jackson St., gladly turned out to help the cause. The Maple Shade, N.J. inhabitant and his outfit, with roots in the Magic New Year’s Brigade, will make its debut in next year’s parade and have been building up for that excitement by engaging in numerous community-centric causes, including a holiday toy drive. Through The Ronald McDonald House and various neighborhood organizations, Shooting Stars will hold a similar call for goodies Sunday at 3 p.m. 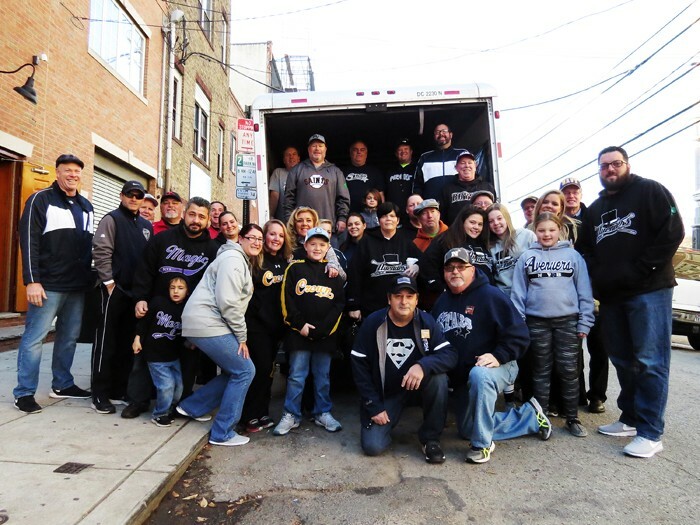 The latter and The Philadelphia Veterans Comfort House have also aligned themselves with Toll Man Joe’s, 26 E. Oregon Ave., which is providing a Thanksgiving feast to 150 veterans. Thirty-eight Mummers clubs contributed to the benevolent bounty. Saturday’s gathering at the headquarters for Bill McIntyre’s Shooting Stars proved a reaffirmation of locals’ respect for veterans.